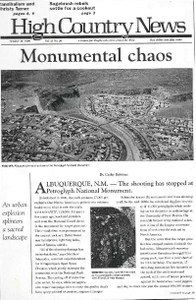 New Mexico's Petroglyph National Monument is threatened by problems that include the runaway growth of the neighboring city of Albuquerque, disagreements over how to manage the resource, and a controversial, embattled superintendent, Judith Cordova. Anthropologist Christy Turner has stirred up a lot of controversy with his book, "Man Corn: Cannibalism and Violence in the Prehistoric American Southwest." In his own words, Albuquerque's Open Space Division director Matthew Schmader discusses the problem of vandalism in the park, and how to prevent it. In his own words, Dave Simon, Southwest Regional director of the National Parks and Conservation Association, criticizes what the Park Service has done in Petroglyph. Legendary mountaineer and outdoor educator Paul Petzoldt, who founded the National Outdoor Leadership Training School (NOLS) and the Wilderness Education Association, has died at the age of 91. The Heard Museum in Phoenix, Ariz., is planning three major exhibits on Indian culture for the year 2000. The Humane Society of the United States has begun its own land trust, the Wildlife Land Trust, which is particularly dedicated to wildlife protection. The completely revised and rewritten book, "The National Outdoor Leadership School's Wilderness Guide" by Mark Harvey, is a well-written guide to being in the forests, deserts and high country. The Environmental Restoration Conference, "Challenges for the New Millennium," will be held Nov. 11-13 in Tucson, Arizona. Utah's Wetlands and Riparian Center holds its second annual conference Nov. 18 in Salt Lake City. Idaho Water Resources Research Institute holds monthly video-link seminars in Boise, Moscow, Idaho Falls and Coeur d'Alene. The Center of the American West wants to know what every Westerner should know and has provided a Web site for discussion and debate. Animal Protection of New Mexico Inc. hosts a conference for animals Nov. 5-7 in Albuquerque, N.M.
Student Conservation Association interns may volunteer to work in the nation's parks through the AmeriCorps program. River Network from Portland, Ore., and River Watch Network of Montpelier, Vt., have merged to form a new group, River Network. Cows in tutus; drinking after driving in Wyo. ; no snowboarders on Aspen ski slopes; cell phones on Grand Teton; ATMs at USFS campgrounds; greenhouse heated by tires vetoed in Colo.; litter contest on Calif. beach; tent-hating Yellowstone grizzly. Getting it right (corrections); the golden season brings visitors. Washington state raises price of Loomis forest; Colorado's Black Canyon of the Gunnison Nat'l Monument to become nat'l park; government buys out Andalex's coal leases in Utah's Grand Staircase-Escalante Nat'l Monument; Bruce Babbitt will not be indicted. President Clinton announces an initiative to protect 40-60 million acres of unroaded national forests. The Mohave Generating Station in southern Nevada agrees to clean up its operation, which has been notorious for fouling the air over Arizona's Grand Canyon. The federal Fish and Game Service has been working successfully with Utah state agencies to restore the least chub without ever having it listed under the Endangered Species Act. In Tucson, Ariz., a mayoral election is heating up over whether the city should try again to make use of the notoriously foul water that comes through the Central Arizona Project. Arizona's Pinal County wants to use the Central Arizona Project's Colorado River water to finally fill Picacho Reservoir in Picacho Lake State Recreation Area.